Y-a-t-il des Ours en Afrique? After a group of tourists have left his village, Meto finds a teddy. Desperate to return it to the little girl who left it behind, he sets off across the savannah, enlisting the help of his animal friends as he goes. They arrive just in time to return the bear to its rightful owner. Y-a-t-il des Ours en Afrique ? is written entirely in French and is aimed at children who are now able to read French all on their own. It is equally suitable for young native French readers or children who are becoming more proficient in French as a second language. 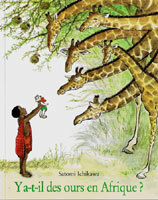 The simple language and appealing story line make this a lovely book for young readers. Je m'habille et... je te croque!